SayWhatNews: Good morning Morgan. Thanks so much for sitting down and speaking with SayWhatNews. First tell us in three words who is Morgan Taylor Campbell? SayWhatNews: So, Morgan I see you did not decide to pursue acting professionally until 3 months before graduating high school—what inspired you to up root yourself from McMurray, Alberta and move to Vancouver to start taking acting lessons? Morgan: I wanted a career that would inspire lots of creativity in me, and I wanted to live somewhere I wasn't familiar with, so I just got up and decided to go learn more about being an actor and if it was where my heart is. SayWhatNews: You are currently studying acting under Kate Twa at the “Railtown Actors Studio”. What key acting tools have you used/ found useful during auditions? Morgan: We work with plays as apposed to film scripts which I love, since I believe theatre to be so important for actors to study. In class we work on script analysis, emotionally connecting yourself to the story, animal work, regression. Discipline and respect for what you do as well. All of these things are useful to me whether I'm working on an audition, in class, or working on a set. SayWhatNews: Morgan, you have guest starred on Disney XD’s “Mr. Young” (teen comedy) and AMC’s “The Killing” (crime drama). Which role, if any, did you find more challenging to portray and why? Morgan: I feel no matter what the role, that it's important to go into it with a lot of empathy and respect for the story you are about to tell. I mean, it really isn't black or white for me. In this case, I felt really challenged by my role in “The Killing” because the content is not a lifestyle I'm familiar with and it required a lot more research on my part. SayWhatNews: First let me say congrats on landing your first lead role in a TV series. How did you learn about the part on the HUB Network’s new show “Spooksville”? Morgan: Thank you! It was just a normal audition process that I went through. Once I found out it was based on Christopher Pike's series, I ordered all the books to get a vibe of what our show was going to be like. SayWhatNews: Tell us about your character Ann Templeton on “Spooksville”? Morgan: Ann is the young heiress, who lives in the stone mansion up on the hill in Springville, with her chauffeur, Moorpark, who is also her only guardian. She is the descendant of Madelyn Templeton, the witch who cursed the town over three hundred years ago. Now, Ann struggles with overcoming the label everyone has bestowed upon her as being an evil witch just like her ancestor. Morgan: I look pretty different when I'm not in wardrobe and makeup, so nobody has recognized me so far, which I appreciate since it's nice to just be able to go out and about and do my own thing. 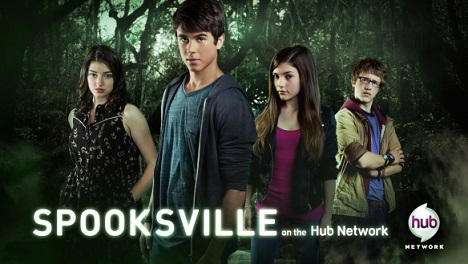 SayWhatNews: “Spooksville” is based on the book series “Spooksville” by renowned author Christopher Pike. You mentioned you ordered all the books….so before landing the role of Ann Templeton, had you read any of the books? Morgan: I hadn't read the books before landing the role, but once I did I ordered them all. I really enjoyed them, especially book seven “The Dark Corner”. When I have children I plan to read them all the books. They have really strong messages for young people. SayWhatNews: Morgan, you were recently cast in the mockumentary, “No Men Beyond This Point” which will do the film festival circuit in 2014. What is the film about? Morgan: It takes place in an alternate version of our world, where women begin to asexually reproduce causing men to become extinct. For me, the film is about equality and how imperative both sexes are to the growth of our society. SayWhatNews: What was it like working on a film set your first time? Morgan: A whirlwind and still is. There are lots of terms that were, and still are, new to me. There is so much going on a film set that it is easy to get distracted, so it's really important to discipline yourself to stay focused on the task at hand. SayWhatNews: I see in your spare time when you are home in Vancouver, you like to do theater with “The Ninja Pirates Theatre Company”. What is it about theater that draws your interest? Morgan: The stories….the writing. It's where I've always trained to be an actor--its home. SayWhatNews: Would you ever like to perform on Broadway? Morgan: I want a career on Broadway. SayWhatNews: Morgan, I see you like an array of things to do in your spare time like kick boxing, learning piano, reading and country music. If, you decided to stop acting today, which would you pursue and why? Morgan: I would live on a horse ranch. Make music, learn to paint, ride, and read. Being around horses brings me a lot of peace. I don't always see myself being in the city. SayWhatNews: What’s next in the future for Morgan Taylor Campbell? Morgan: I haven't fully honed in on my psychic abilities yet, so for now, I'm going to keep just doing what makes me happy and see where it takes me.